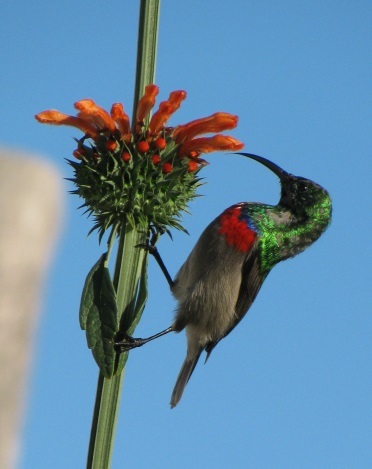 Iingcungcu is an isiXhosa name referring to Sunbirds and Sugarbirds with long beaks. Inspired by the global decline in pollinators and the need to nurture leadership for biodiversity in youth, the study focuses on the interaction between nectar-feeding birds (the iconic Sugarbirds and Sunbirds) and bird-pollinated plants. Whereas there are only four species of obligate nectar feeding birds in the Cape, i.e. the Nectarinia famosa (Malachite Sunbird), Anthobaphes violacea (Orange-breasted Sunbird), Cinnyris chalybea (Southern Double-collared Sunbird) (Fig. 1) and the Promerops cafer (Sugarbird), they pollinate about 350 plant species. These four species are arguably threatened by habitat fragmentation, urbanization, road traffic and honeybee farming. The study attempts to find suitable ways through which to connect small pockets of protected areas in the low lying parts of the Cape Flats with areas where the birds are known to occur. Through an attempt to answer the ecological question of whether corridors can be established to facilitate the movement of specialist nectar feeding birds across a landscape, a reason to find a suitable corridor was escalated. The study therefore follows a case study approach whereby a corridor is selected based on various variables including the availability of open grounds for the establishment of bird-pollinated plant gardens, the proximity of the open grounds and the projected connecting areas. One of the critical points was the buy-in from the various school heads to be part of the project. The aim was for the established gardens to be managed by the schools themselves in order to stand a chance of survival. The schools needed to adopt these gardens from the onset. Eight schools including four primary (control sites) and four high (planted gardens) schools within the corridor were selected. The gardens were only established at the four high schools as the project was targeting grade 10 learners for participation. The participation would include learning to plant indigenous bird-pollinated plants and nurture the gardens. The leaners would also form part of the bird observation team. To eliminate any possible contamination of data, two data sheets would be used (i.e. one by the leaners and another by the research team including myself). The bird observation data collection would include a before and after planting. The leaners would also receive a questionnaire to track their interest in biodiversity before participating and after their engagement within the project to determine how their interaction might have shifted their interest towards biodiversity. In 2013, selected nurseries were contracted to propagate plants found only in the Cape Flats Dune Strandveld (CFDS) and Cape Flats Sand Fynbos (CFSF) vegetation types. The bird-pollinated plants included species of Erica, Protea, Wild Dagga, Watsonia, Aloe and various others (Fig. 2). The plant species were derived from over 400 plant species list which was established as part of the study methodology where bird-pollinated plants for the Cape Province were produced. Following a successful propagation of these plants, mainly because they were all propagated from cuttings to accelerate flowering within the first year of establishment, all the plants were planted in April and May 2014 (Fig. 2). Bird observation data collection continued in July 2014 until December 2014 and this time, we looked at the after planting bird observations as well. The learners who participated in the planting exercise were very much excited by the planting activity and the project itself. Interestingly the plants also seem to have responded very well after being put in the ground by producing flowers and attracting sunbirds in the first season. It is worth noting that since the first year of planting, only the Southern Double-collared Sunbird has been recorded, which could not be recorded before the bird-pollinated plant gardens were established at the four high schools (Table 1). Although this result on its own cannot constitute a success in the establishment of corridors, it does however present itself and as a clear indication that we might be doing something right towards to the establishment of ecological corridors. Table 1. 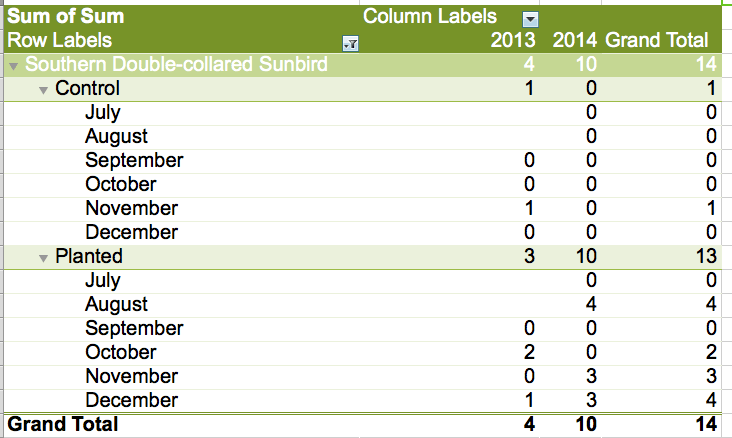 Number of Southern Double-collared Sunbirds recorded following the establishment of bird-pollinated plant gardens. This study has since produced a poster and a short film (Stepping Stone available www.caretakers.co.za) both of which have won a Theo Manuel Award hosted by the University of Cape Town and awarded to projects which promote the link between Conservation and Education. These awards were handed to me at the annual Fynbos Forum Conferences, which took place in 2013 and 2014, respectively. Two radio stations (Classic FM and RSG) hosted interviews on the study, whereas two daily papers (Cape Argus and Cape Times) published the study too. The Big Issue, 25 July 2014 also published an insert on the study. Furthermore, to reach out to as many people as possible, the study also created a FaceBook page (The iingcungcu project: Sunbird Restoration) with over 100 likes to date. The best way to stay abreast of what is happening on the project is to like the page. A webpage was also created http://academic.sun.ac.za/botzoo/iingcungcu/index.htm. While the study itself would have to produce a thesis at the end of 2015, the project is likely to continue through various greening projects and biodiversity & education programmes. About the Author: Bongani Mnisi is the Regional Manager in the Biodiversity Management of the City of Cape Town where he manages the largest part of the City’s Biodiversity Network including three Nature Reserves. His responsibilities include the development of strategic and operational management plans for the region as well as managing stakeholder relationships both external and internal to enforce a participative approach towards conservation management. The aims of “The Iingcungcu Project: How restoring the nectar feeding bird community can identify and nurture leadership for biodiversity” are to bring about a convergence in ecology and society. The academic component of the project will attempt to answer the ecological question of whether corridors can be established and facilitate the movement of specialist nectar feeding birds across a landscape where they have been commonly known to occur in the past. The civil society component of the project will be a hands-on attempt at community engagement, in particular involving high schools. The project will be rolled out in Cape Town as a pilot project transferable to other urban areas. The ultimate aim is for Municipalities to take ownership of the project. My research questions therefore are; 1) whether planting of nectar plants will restore nectar feeding birds; and 2) whether restoring nectar feeding birds will have a positive effect on school children and in particular will help identify and nurture leadership for biodiversity?